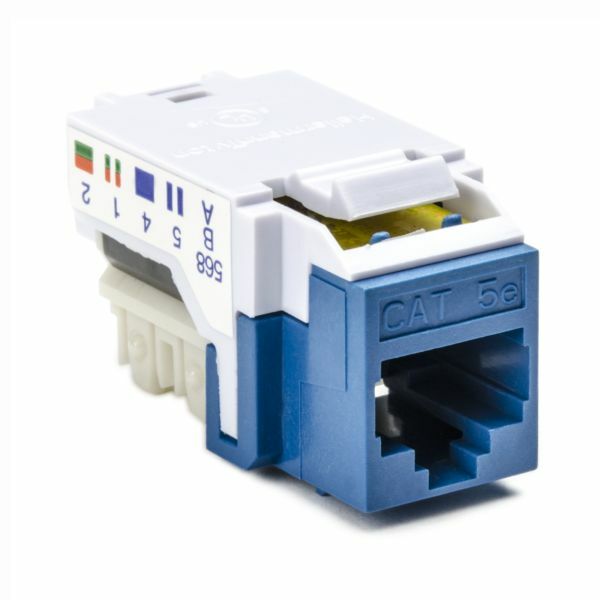 • Category 5e jack has been uniquely designed adopting HellermannTyton's globally tried and tested 10-Pin technology which guarantees superior performance and connectivity. • Standard keystone style interface provides flexibility in connecting components. • Unique strain relief design secures cable terminations. • Configured to both TIA 568A and 568B wiring schemes for installation versatility. • Suitable for air handling spaces. • Category 5e jack has been uniquely designed adopting HellermannTyton's globally tried and tested 10-Pin technology which guarantees superior performance and connectivity. • Standard keystone style interface provides flexibility in connecting components. • Unique strain relief design secures cable terminations. • Configured to both TIA 568A and 568B wiring schemes for installation versatility. • Suitable for air handling spaces. The MegaBand flush mount Category 5e modular jack offers exceptional performance that will support Gigabit Ethernet and 622 Mbps ATM applications with complete reliability. This Category 5e jack meets and exceeds the requirements of ANSI/TIA-568-C.